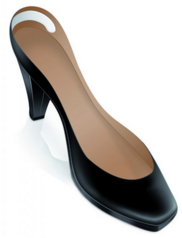 Self-adhesive heel grip protector made of silicone. It is washable and hypoallergenic. It is transparent and discreet. Suitable for all kind of shoes.